Its been a troubled season both for Maccabi Tel Aviv (coach Kattash fired and way too many losses in the domestic front, the last one right this past weekend at home to Bnei HaSharon) and also for Omri Casspi. The brightest Israeli promise has struggled to get playing time in Tel Aviv, which seems pretty logical if we consider that Maccabi is a true European powerhouse. However, hes just coming off his longest court-tenure in the Euroleague this season, precisely in a crucial victory against Real Madrid in the Top-16 stage that allowed Maccabi to clinch the first position in its group. Casspi stayed in the game for 24 minutes, and finished with 10 points, 4 rebounds, 3 assists and 2 steals. A legit 6-9 combo forward, coach Sherf used him mostly as a small forward, but Omri often officiates as a power forward as well, as he proved in his previous outing against Hapoel Gilboa/Afula (scoring 20 points off the bench, by the way). Hes long, hes well built and hes also quick for his size. Actually, the biggest concerns about his ability to play small forward come from the defensive end, but hes showing a bit better lateral quickness and aggressiveness, staying closer to the ball (he used to rely more on his length to defend perimeter guys, conceding them too much space in order to prevent them from slashing past him). This is one of the main areas that coach Sherf has been helping him out the most actually, and he wouldnt be able to get minutes for the old-school conservative coach if he wasnt producing for him on this end. Offensively were seeing mostly a face-up player, very incisive with the ball in his hands, but also active playing off the ball. Casspi enjoys nice ball-handling skills, a solid first step, and excellent footwork. He can attack both ways, and uses his body really well to work his way towards the basket. Hes an aggressive player with great body control, who doesnt fear contact at all. Against Real Madrid, he beat one of the best perimeter defenders in the Old Continent, Charles Smith, off the dribble, attacking him in a pure one-on-one situation with his left hand. Without the ball, Casspi actively cuts, often in back-door fashion, delivering mostly moves towards the basket. Following this trend (of activity without the ball and getting near the rim), he also emerges willing to clean the offensive boards looking for second-chance points, always trying to cash in off his superior size. His shot isnt emerging as his best weapon at this point. Hes not looking very prolific or particularly effective. Casspi basically settles for spot-up three-pointers that hes not connecting on consistently. Confidence is an issue, but his the necessity to remain as efficient as possible in his overall game in order to receive playing time probably gets the upper hand here. For the moment, Casspi is sticking to his strengths, which means no wild off-the-dribble shots that we used to see him delivering in youth categories. Anyway, he is better off starting the build the house from the foundations up first, and work hard on his jumper to gain accuracy in those open treys that will allow him to keep defenses honest in the future. As for the rest of his game, we should mention his devotion for the transition game (he loves to run the court, and eventually even while dribbling the ball) and the nice passing game hes showing, feeding the low post or recognizing cutters to pass to; nothing really outstanding, but nice stuff to round out his game. 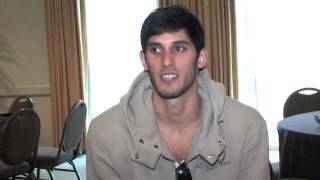 In case anybody is still wondering, Casspi is still a very legit NBA prospect: the guy very talented, really competitive, and enjoys an intriguing physical profile. He needs to keep working on his game, on his defense and shooting stroke, continue being serious on the floor, and stay patient with both his playing time in Maccabi and a hypothetical desire of rushing an American adventure. Besides Danilo Gallinari, there was another intriguing prospect on hand here in Milan, going by the name of Omri Casspi (click his name to read much more). The 6-8 athletic small forward is considered one of the best prospects Israel has produced in quite some time, but hes been struggling to get consistent playing time on this team after having a breakout season last year on loan with Galil Elyon (where he was coached by Maccabis current coach Oded Kattash). Casspi looked quite frustrated in his very short time (4 minutes) on the floor, and did not look particularly thrilled sitting on the bench either. His first possession in the game, he basically tripped over his own feet trying to guard Gallinari, but came back on the other end of the floor and had a nice dish to an open teammate after putting the ball on the floor with his left hand. He passed up an open 3-pointer on occasion (not his biggest strength), and had a very difficult time on the defensive end once again being matched up with Milano's beastish power forward Travis Watson, who got very physical with him. That was about all we saw from Casspi on the night. It's not shocking that he isn't playing really, as he's extremely young and still a bit stuck between the 3 and 4 spots (certainly defensively) as this high a level. Maccabi knew this, though, but still demanded he return to the club this past summer and basically guaranteed hed have a fixed spot in the rotation (probably to make sure he doesn't hurt them playing for some other team--the way he did last year with Galil). That doesnt seem to be the case right now, and its a shame considering that hes only 19 years old and clearly needs to get as much playing time as possible. His father even went so far as to complain publicly in the media and threaten to have him leave the club if he doesnt start getting more minutes. We have Casspi projected as a late first round pick at the moment, but the circumstances seem to indicate that he will probably have to wait another season. The Israeli small forward came to Memphis just over a week after he led Galil Eliyon to an upset victory over European powerhouse Maccabi Tel Aviv in an Israeli league game. Casspi was ironically loaned to Galil from Maccabi at the beginning of the season, and will likely be returning there next year. With two seconds left in that game, he went to the coach during a timeout and asked for the ball which resulted in the game winning assist. Throughout the week in practice, there were many great flashes of potential from Casspi in various aspects of the game. Despite his poor shooting mechanics, he knocked down some NBA range three pointers during the week, with a number of them coming in the two scrimmages. His consistency in this area will need to improve, and an adjustment to his form and release would help greatly. Casspi possesses the athleticism to play the American game, and he made a number of creative slashing moves through the week to prove that. The ability to finish with either hand in traffic helps in this area, as does the good vertical leaping ability and the way he can take contact in the air. To further advance his game in this area, he will need to improve his creativity around the hoop. An important area of Casspis game goes unnoticed unless you have the opportunity to see him in person. Throughout the practices this week, he was the vocal leader on the floor, offering encouragement and guidance to his teammates, especially the ones who struggled to grasp the English language. When there was a mismatch on the floor or when his team needed a pick me up, Casspi was sure to announce it to his team. The coach for the World Select team named him captain of the team because of the leadership he displayed throughout the week. In the game, Omri Casspi had the best individual stretch of any player during one particularly impressive sequence. After the international team started slow, Casspi provided a much needed burst of energy. With around 5 minutes remaining in the second quarter and the world team down 40-13, he used an isolation drive to the hoop to draw a foul on Kevin Love. On the next world team possession he took the ball to the basket in transition for a surprising dunk on Patrick Patterson. Casspi made his way back down the floor to play defense, and then stole the ball, taking it coast to coast and finishing with a reverse dunk. This stretch by the young Israeli boosted the international team beyond their slow start, and gave them the spark needed to eventually cut the lead to 10. The rest of the game led to a few more nice flashes for Casspi, but nothing that stood out like his run in the second quarter. In transition, he dribbled the length of the floor and made a nice spin move away from the defender before stepping towards the basket and drawing a foul. He also made a nice floater from about 8 feet on a baseline drive. Defensively, Casspi will need work on his positioning, though he plays with great effort. He has the tendency to overplay the ball too often, which makes it easier for quicker players to get past him. At this point, there is a small chance Casspi could enter his name in the draft, but he would surely withdraw it without a promise. He has the potential to be a good all-around small forward in the NBA, but improvements to his shooting and defense will be necessary before this happens. Another year of progress in Israel could do wonders for developing Omri Casspis game. Omri Casspi again displayed some good potential, but struggled in the paint at times. Sometimes he gets caught in traffic with no place to go and this has led to a number turnovers over the past couple days. Casspi was knocking down the mid-range jumper today in the scrimmage, but his accuracy decreases when he tries to shoot off the dribble. In transition, the young Israeli has developed great chemistry with Nicolas Batum, and the two of them operated several fast breaks where the ball didnt touch the floor until after it had passed through the basket. He has the ability to have a good showing in the game tomorrow, and it will be interesting to see how his game translates against the U.S. high schoolers. Omri Casspi struggled with his shot during the morning practice at the Nike facility, but knocked down a number of threes in the scrimmage back at the Fedex Forum, including a couple from NBA range. The Israeli forward also made a nice play in transition by giving the ball up to Nicholas Batum early, and cutting right to the basket for an easy layup. He created a number of nice scoring opportunities off the dribble throughout the game but will need to work on finishing against more athletic players once he gets to the rim. At the basket, Casspi kept getting caught in the air with no place to go and this led to a number of forced layup attempts. Defensively, he played with great effort throughout the scrimmage, but he will need to stop gambling for steals so often, and getting caught out of position. Israeli small forward Omri Casspi also stood out during the scrimmages, scoring the majority of his points slashing to the hoop. His shooting mechanics could still use some improvement, and he put in some extra time after practice with the coaching staff working on shooting form. Casspis feel for the game has progressed, and he made some very nice passes in traffic. Shot selection is still a work in progress for the young Israeli, though his slashing game appears to be a very good weapon at this point. Omri Casspi played a good game for Galil, but all of his scoring came in the second and third quarters. Casspi made a turnover early in the game followed by a missed defensive rotation, so he was pulled after two minutes. He didnt seem to be affected by his slow start when he re-entered the game at the 5:51 mark in the second quarter. Unable to finish on a nice drive to the left, he was able to get his own rebound and put the ball back into the hoop. Casspi also displayed the ability to create off the dribble when he jabbed left, took a dribble to the right, crossed back over, and made a mid-range jumper. His shooting mechanics arent the best, but his release is consistent and his shot goes in more often than not. He could help himself by releasing the ball a little bit higher and adding a little more elevation to his jump shot. Casspi made some nice drives to the basket, and does a good job controlling himself in the paint. On one drive he went left all the way to the basket, and brought the ball back to the right side and made a layup right under the defenders arm. Omri displays good instincts when it comes to basketball, but will need to learn how to operate better within the flow of an offense. Omri Casspi didnt have a great game, though you can easily tell why hes an NBA draft prospect. Hes about 68 with a good frame, and a long wingspan. He was originally developed to play the power forward position, but 2 years ago the decision was made that his future would be brighter as a small forward. Athletically, Casspi is smooth, and very coordinated, especially with his ball handling. He was able to penetrate into the paint numerous times off the dribble, and created some very easy baskets for him teammates in doing so. Sometimes international prospects get the reputation for being soft, but this isnt the case with Casspi at all. Numerous times in the game he fought against much larger players in the paint. On one occasion he kept a big center off the boards with his body, and then elevated over him for an offensive rebound. Despite the fact that hes still learning to play the small forward position, he has a very good feel for the game, and is often in the right place at the right time on the court. On the defensive end, Casspi moves his feet well, and can usually stay with opposing wing players, but he struggles to get up close to the defender and apply lockdown pressure, especially when trying to full court press. In zone defense, he was always able to be in the right position to help teammates and get rebounds. Casspi finished the game with 23 minutes, 5 points 1/2 from 2, 1/1 from the 3 point line, 3 rebounds, 1 turnover and 1 blockvery much below average by his standards. Casspis impressive outing in Mannheim wasnt a fluke, and he certainly proved to have made strides since his average showings last summer. On a team that lacked some brains in the backcourt, he assumed the go-to role with intriguing although not always good results. He now looks like much more of a natural perimeter player than last year. He might still not be a top-notch athlete, he might still suffer defensively against quick wings, but his skill set has evolved in the right direction. Its really remarkable his ability to step into the lane dribbling past his defender. Showing very nice ball-handling skills, including a very effective crossover move, he gets by his rival after unbalancing him. But he also shows a nice first step and very good footwork to approach the basket, while his size, strength, body control and ability to convert layups do the rest. Those skills wouldnt mean that much without the confidence and aggressiveness he shows (he eventually looks for contact penetrating), which make him succeed on a regular basis attacking the basket. Although still inconsistent, his jumper is another source of consistent and versatile production. Casspi enjoys a wide array of releasing options, including range out to the three-point line, off-the-dribble skills, fade-away fashion, nice catch-and-shoot ability coming off a cut or the step-back jumper. However, and especially when shooting from the perimeter, his mechanics still could use some more consistency that would significantly help his accuracy. From mid-range distance, he sometimes knocks down shots so confidently and well-executed that you think he could never miss. He can eventually take advantage of his size and good strength in the low post against smaller defenders, even showing a decent semi-hook shot. A smart player with a good feel for the game, he easily finds his teammates on the court beyond finding his own scoring options. Intense, aggressive, he shows plenty of character playing the game. He works well on defense and stays alert to the passing lines, although his lateral quickness is just average for a small forward, drawing concerns about his ability to stay in front of quick wings. A nice rebounder, he uses his length, strength and athleticism well. All in all, hes a guy willing to do the little obscure things. Pair these characteristics with his skill set, and we have a guy set to succeed at least at the European stage. Out of the combo forwards that were including in this article, Casspi looks like the least athletically gifted to play small forward at a top level, even if theres certainly hope for him. Standing somewhere between 6-8 and 6-9, he only displays average athleticism for a three, while still not enjoying a refined perimeter game. Omri is rather strong for his age, showing quite a good frame, and like most players coming from Israel, hes rather aggressive in certain situations. He loves to attack the basket, whether after receiving the ball in the high post or starting himself from the perimeter. He can put the ball on the floor with both hands and features nice footwork in the slashing movement. He doesnt fear physical contact at all, having the ability to finish himself against opposition, but also to dish to an open teammate or deliver a mid-ranger off the dribble. However, Casspi is not particularly consistent with his jumper. Enjoying three point range, although only in static fashion, he doesnt look really fluid with his mechanics. On defense, he didnt suffer too much trouble quickness-wise, but playing in the paint he was rarely matched against perimeter players. Its not clear if he features good enough lateral movement to keep it up against quicker small forwards. Having to battle in the paint full time, he was reliable in the rebounding department, especially if you consider his youth. What was missed from Casspi was some more consistency in his game. For some stretches he was totally a non factor, when he was clearly the most important player of Israel besides Ohayon. On the other hand, he showed nice understanding of the game. All in all, we were expecting a little more out of him, particularly in terms of potential.